BCB « Welcome to Property Source Nation! According to the Asthma and Allergy Foundation of America, about one in every five adults and children suffer from allergies, including allergic asthma. Many health groups have recommended three simple strategies for effectively reducing indoor air pollution. First, control the source of pollution. Remember to clean regularly, including changing sheets and vacuuming often. Wipe down all surfaces with an appropriate cleaning solution and discard clutter as often as possible. Consider replacing old shower curtains, floor mats and anything on which mold is likely to appear. Also remember to adequately ventilate your home. Today’s homes are built more energy efficient to hold air inside avoiding heat loss in the winter and heat gain in the summer. Of course, what’s better for your energy bills isn’t necessarily better for indoor air quality. Opening windows may help circulate in the home. But remember to close them during high allergy seasons, where pollen could enter your home. In addition, clean the indoor air. An indoor air cleaner may significantly reduce the level of pollutants in a home. Before purchasing an air cleaner, know the square footage of the room you want to treat. You’ll want to select an air cleaner that’s large enough for the room you’re treating. Also, consider air filtering efficiency. You’ll want an air cleaner that’s proven to deliver filtered air. Look for the CADR seal on the product packaging. The seal shows how well an air cleaner reduces pollutants such as tobacco smoke, pollen and dust and also lists the unit’s recommended room size. From air cleaner to air cleaner, compare the CADR numbers. First look at suggested room size. Then refer to the dust, tobacco smoke and pollen CADR numbers. The higher the numbers, the faster the unit filters the air. If from one unit to the other ratings are the same, their air filtering performance is similar. You can then weigh the importance of product features to find an air cleaner that fits your needs. How Much Can you recover From the Cost Of A Remodeling Project If You Resale? Carmen Santora, Executive Director of the Better Contractors Bureau in an effort to help homeowners contemplating a major remodeling project and who are concerned if the cost invested would be recouped should they decide to sell their home offers the following information. His analysis is based on a national average “cost vs. value” survey and condensed it to specifically relate to our local area. The resale value depends on a lot of variables, such as the state of the housing industry and local market conditions in particular at the time of sale. A lot of homeowners are concerned that their remodeling investment doesn’t price their home out of the neighborhood averages. This should only be taken into account if you think that you may be selling your home in the near future. If a homeowner has small children and is thinking of adding extra bedrooms or an additional bathroom they may want to think of the advantages of staying where they are. If the schools are great, they live close to their workplace and shopping and are in an area of lower taxes or other personal conveniences, then they shouldn’t worry about pricing themselves over their neighborhood averages, especially if they intend to stay there for many years. However, if the homeowners know they will be staying where they are for only a short time then a major remodeling would be foolish. Things like energy efficient updates such as new replacement windows, high efficiency furnace, roofing or siding, kitchen or bath updates would add to their comfort and help to sell the house faster and save them money while they still remain in the home. Major expenditures for a new kitchen and bath can run into thousands of dollars and unless money doesn’t matter or you don’t care about resale values then by all means go for it. It’s important to know that there are a variety of variables that can effect both the cost of the remodeling and the resale of the home such as the size of the remodeling company estimating the project and the values of the properties in the surrounding neighborhoods. 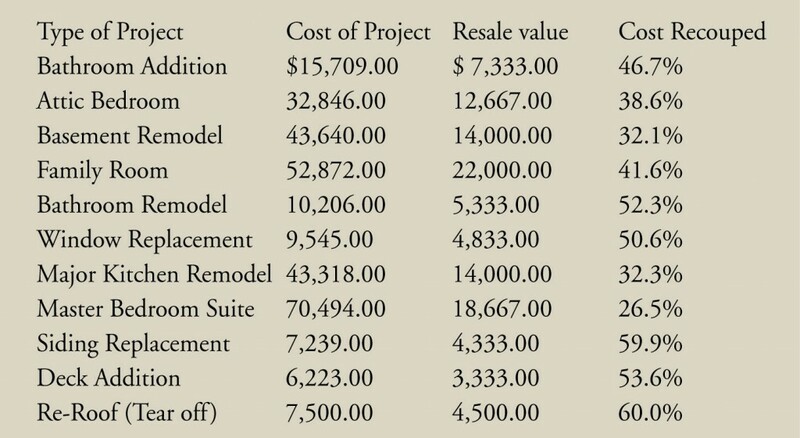 Below are some area examples of the cost of what some remodeling projects can cost and what could be recouped if you sell your house. The numbers presented here should only serve as guidelines when contemplating the potential return on your investment for a particular remodeling project. For a more information as to a more precise explanation of what the projects mentioned above include call the Better Contractors Bureau at 338-3600. Recovery costs for home improvement projects remain high and have been accelerating even though the growth in spending on home improvements has declined nationally for most of 2003. As the economy improves so will spending on home improvements. Lower priced projects during a sluggish economy are typical and usually only what is needed to keep a home energy efficient or make essential repairs. Higher priced projects tend to be more discretionary, and usually homeowners wait for the economy to improve before undertaking these expenditures. In some market areas where house prices are growing rapidly, and local economies are doing better the average cost recovery can be much greater than the figures shown. The National average for cost recouped for the projects mentioned in 2003 was 86.4% and higher than 2002. Some areas such as Los Angeles, Miami, New York, San Diego, and Washington were much higher and averaged as high as 109%. Some areas as Cincinnati, Cleveland, Dallas, Detroit and Indianapolis averaged 65% or less. Carmen Santora, says that he believes that within the five county area that the BCB services, the average cost recouped for home improvements probably falls lower than the national average and is somewhere around 75% or less range. The Better Contractors Bureau is a non-profit consumer protection agency that was formed in 1974. Its goals are to “PROTECT & INFORM” the consumer and ELIMINATE the unscrupulous contractors in the area. The BCB as it is also known operates in Monroe and the five surrounding counties and has over 400 members. The bureau handles complaints, mediates disputes between the contractor and consumer (not just members) and refers contractor members by way of a FREE Consumer Guide & Membership Directory. For more information you may call 338-3600 or go to the BCB website at www.the-bcb.net. Right after the holidays many consumers will be thinking of that remodeling project that they want. New York State regulates the sale of home improvement goods and services and applies to most types of improvements costing more than $500 purchased by homeowners. 3. A start and completion date, including any contingencies which would change the completion date such as bad weather. You may also want to have included a penalty clause for running over the completion date. A $100 per day deduction off the contract price is common for every day that the project runs over the completion date. 4. A clause that reads that “any progress payments received by a contractor from a customer can only be made if they bear a reasonable relationship to the work actually done, materials purchased or related costs. 5. Any payments received by a contractor from a customer prior to substantial completion of the job must be place into a escrow account in a bank located in New York State within five business days and the customer must be informed where the money is held within ten business days. upon substantial completion of the job; or if the customer violates the contract, but only to the extent that the amount covers the contractor’s reasonable costs. 6. A complete specification description of the work and materials, including brand names, model numbers and other identifying information. The customer has an unconditional right to cancel the contract until midnight of the third business day after the contract was signed. Cancellation must be done in writing! If the contractor or subcontractor who does the work is not paid, he or she may have a claim against the customer’s property under the Lien Law. 8. Warranties and guarantees should be stated in the contract. Be sure to understand if the warranty or guarantee covers both the materials and labor and if they are prorated and transferable. For example a new roof job may warrant the materials for 25 years but the contractor may only warrant his labor for one year. There are penalties against contractors and consumers may sue for actual damages, plus a $500 penalty and reasonable attorney’s fees if the contractor has used fraudulent written statements to get the contractor to sign the contract. The Attorney General is also authorized to go to court to stop illegal practices and order contractors to compensate defrauded customers. Contractors can also face civil fines for violating the provisions of the law, especially with the protection of the customer’s payments. Determine exactly what work you want done before you decide to get estimates. Get three estimates from contractor companies that are similar in size. Be sure to check for verification of Liability and Workmen’s compensation insurance. Check the contractor’s reputation with the Better Contractors Bureau, banks and suppliers. Make sure when you decide on your final contractor to do the job that you are signing a contract that meets all the requirements of Article 36A of the NYS Business Law. Do not pay a large deposit in advance of the start of the project unless it is for a specific reason such as special order cabinets or windows, etc. Instead negotiate a payment schedule tied to the completion of specific stages of the job. Don’t pay the final payment unless you are satisfied and the job has been completed as per the contract specifications. Incredible Product Showcased on PSR – Listen Now! Mike Dana of Rochester Power Saver is our guest on Property Source Radio 2/19/11 (This show online now – Click here to listen) and shows us a truly cost effective way to reduce your electric bills. Tune in to get all the details! This product is 100% built in the USA!